By Jay Friedman. By Various. Sheet music. Music Minus One. Instruction. Softcover with CD. 16 pages. Music Minus One #MMO3918. Published by Music Minus One (HL.400739). ISBN 1596154764. 9x12.25 inches. 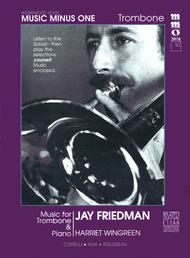 Jay Friedman, trombone and Harriet Wingreen, piano. The music in this pack has been chosen from the very best solo literature for trombone and is performed by the foremost vituoso of our time. The CD includes the complete performance, the piano accompaniment, and an alternate (slower) tempo for pieces taht present a more complex technical challenge. A printed copy of the solo part with cues and rhythmic notation is enclosed with each CD. This pack includes works by Arcangelo Corelli, P.V. de la Nux, and Samuel Rousseau.